It is important to have a properly-functioning furnace and heating system to provide relief from cold winter days. If your furnace or heating system is showing problems such as blowing cold air, making strange smells or sounds, producing unusually high energy bills, or others, then it could be in need of a professional service or repair. If you are in need of heating and furnace service or repair, the professionals at Homeplace Heating & Air are your perfect choice for the job. We will show up quickly, diagnose your system’s problems, let you know what the repair will cost, and then fix your problems promptly and precisely. Also, because we have a certified electrician on staff, you will not need to call and deal with a separate electrician in the event your system requires electrical work. Regardless of the specific issues you are having with your system, the experienced technicians at Homeplace Heating & Air have you covered. Our diagnostic and repair capabilities include components such as burners, igniters, gas valves, gas lines, flue venting, pressure switches, compressors, fans, blowers, coils, thermostats, motors, capacitors, contractors, circuit boards, relays, and much more. 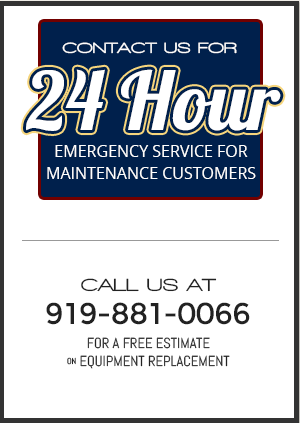 Call us today at 919-881-0066 for a free estimate and let Homeplace Heating & Air handle all of your furnace and heating system service and repair needs.